The 5th Avenue South Business Improvement District announces line-up for 45th Annual Christmas Walk and Tree Lighting Ceremony taking place on 5th Avenue South on Friday, December 7th, 2018 from 5:00 – 8:00pm. This signature holiday event will feature live music, live art performances, festive food offerings, and activities for all ages. Signature events during the 45th Annual Christmas Walk and Tree Lighting Ceremony will be the live nativity scene on the corner of 5th Avenue and 3rd Street, the lighting of the Christmas tree on Baker Stage, the first ever skating rink on 5th Avenue on the corner of 5th and 8th, and the snow covered Sugden Plaza. Mayor Bill Barnett will be in attendance and local ABC7 news anchor Krista Fogelsong will host the Christmas tree lighting portion of the evening. This will be the first time a skating rink is hosted on 5th Avenue and the synthetic ice is sure to enhance the winter feeling at this south Florida signature event. Sponsored by Kurnik Law, Wynn’s Market, Hoffman Commercial Real Estate, DeVoe Automotive Group, C3 Gardens, Gator Golf Cars, Naples Daily News, Iberia Bank, GulfCoast Motorworks, and Renda Broadcasting, the annual Christmas Walk and Tree Lighting Ceremony is one of Naples’ oldest and most treasured traditions. This is a unique opportunity to bring together the businesses of 5th Avenue South and guests to celebrate the holiday spirit with a can’t miss event. Guests are invited to enjoy their treats while experiencing unique live art performances by Marcus Zotter, Matt Mullhen, Esau Rodriguez, and Marvin Rouse. Arrays of musical performances are scheduled throughout the evening, both along the Avenue and on Baker Stage in Sugden Plaza. Sugden will have scheduled performers from 5:00 through 8:00pm. Among the musical performances will be Opera Naples, a Tuba Christmas Quartet, Matty Jollie & Sarah Hadeka presenting a pop Christmas medley, and Ghaleb – a renowned opera star known for his powerful tenor voice and electric classical/flamenco guitar skill. Additionally on Baker Stage, The Naples Players will present a scene from their December musical, White Christmas, 5th Avenue sponsors will be recognized, Santa Claus will arrive escorted by Ave Maria dancers, and ABC7’s Krista Fogelsong & Mayor Barnett will host the tree lighting countdown. Snow will be released during the tree lighting ceremony at approximately 6:15, and again during the second half of Ghaleb’s set at 7:30. Along the Avenue, Gianna Minichiello, Patchouli, The Woodwork, Steve Hill, and Tamesha Edwards will be charming guests with holiday tunes. The North Naples Middle School and Oakridge Middle School string orchestras will also be positioned along the Avenue. Each school will bring roughly 25 students to play Christmas carols for the crowd. 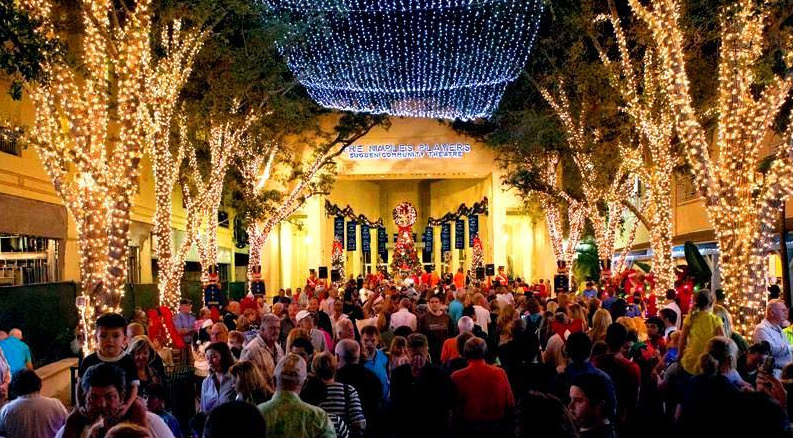 According to 5th Avenue South Business Improvement District Executive Director, Bruce Barone Jr., “We are thrilled to continue this signature Naples tradition here on 5th Avenue, and it being the 45th year makes it even more special. We expect to draw statewide attention and are planning for a festive and fun evening. Between Ghaleb’s impressive performance and the snow in Sugden Plaza, the Christmas Walk and Tree Lighting Ceremony is sure to put you in the holiday spirit,” adds Barone Jr. The 5th Avenue South Business Improvement District (BID) was established in 2010 to promote 5th Avenue South through avenue enhancement, marketing, events and business and property services. Its mission is to brand, promote and create awareness of the 5th Avenue South Business Improvement District to residents and visitors as the destination of choice to live, work, shop, dine and play. Managed by a board of directors representative of district boundaries, the BID represents the interests of both property owners and businesses in growing and sustaining a healthy, vibrant 5th Avenue South district. The BID is located at 649 5th Avenue South and can be reached at (239) 692-8436. Visit https://www.fifthavenuesouth.com for more information.